Music that inspires contemplation and heightened senses can take many forms – introspective and quiet or gregarious and exuberant in its complex rhythms and earthy melodies. 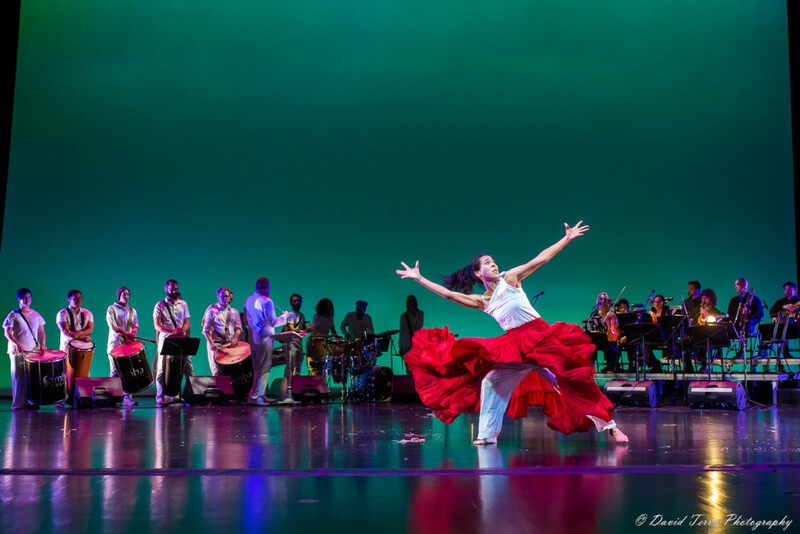 For its upcoming concert, Samba Fogo turns to the Portuguese word for listening – Ouça – as its theme for an evening of high-octane dance, live music and fire spinning celebrating Afro-Brazilian culture and mythology. This year’s spring show is packed with talent. In addition to the 12-member dance ensemble, there are vocalists Solange Gomes and George Edgar Brown, who come from São Paulo and Brasilia. The accompaniment includes a string quintet, horn line, and a mobile “bateria” Brazilian drum line of 20 musicians. And, for veteran Samba Fogo attendees, there is plenty of fire spinning. “This year, about 30 percent of the show will incorporate fire,” Hansen adds. Performances will take place daily April 26-28 at 7:30 p.m. in the Jeanne Wagner Theatre of the Rose Wagner Center for Performing Arts. Samba Fogo was conceived as a volunteer community ensemble of people dedicated to learning about the Afro-Brazilian dance and musical culture nearly a quarter of a century ago but in Salt Lake City’s phenomenal dance arts scene, it also has evolved into an international-class ensemble that sells out concerts and has become one of the Utah Arts Festival’s most anticipated performing groups when it appears every other year. 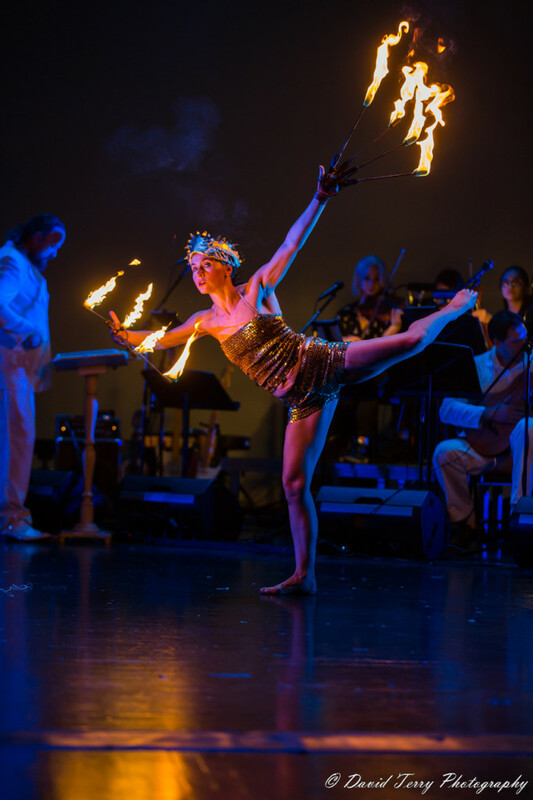 The concert highlights several major strands of the music and dance culture. These include Orixá dance movement inspired by the rhythms and legends of Afro-Brazilian deities of nature (the Orixá, pronounced as oh-ree-sha). As noted previously in The Utah Review, samba is known as the rhythm of the saints and Brazilian slaves worshiping in their Macumba religion called their many gods by beating drums. Even as Brazil identifies strongly with Catholicism, the worship of many gods (Orixás) is taken up by millions in the country. Dances and accompanying music indicate the nature and character of the gods. Other dances are rooted in the warrior deities from the northeastern region of Brazil as well as a guaranteed crowd-pleaser, Carnaval Samba, resplendent in elaborate costumes that recall Rio De Janeiro’s Carnaval celebrations and incorporate fast-paced footwork with equally fast-paced music. One piece titled Proteja (Protect) incorporates movements to describe Ogum, the vicious, bloodthirsty, take-no-prisoners god of iron, technology and war. The muscular feel is intensified by Acenda (Ignite), which uses movement to signify Xangô, the god of fire, lightning, justice and drumming. In the folklore, Xangô’s fire was stolen by his wife Oya, the epitome of the fierce warrior of the wind. Some pieces imbue the mythological cultural significance with personal meaning for Samba Fogo’s performers, such as Agradeca (Appreciate), featuring the song titled Muito Obrigado Axé by Ivete Sangalo. This selection is dedicated to the mothers of Hansen, the group’s artistic director, and her husband, Mason Aeschbacher, music director. Its folkloric roots honor the Iyabas, the trio of mothers from the Orixá tradition: Oya (wind), Oxum (freshwater) and Yemanja (all of the planet’s waters). 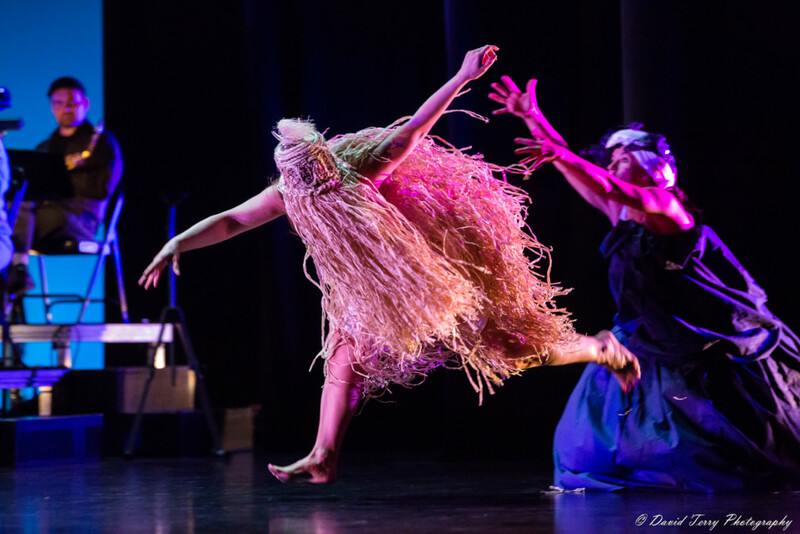 In Embeleze (Adorn), a work arranged by Aeschbacher and choreographed by Hansen, the legendary tale of Ossain, master of medicinal plants, and Oya, the seductive goddess who stole Ossain’s sacred plants and scattered them in the forest, is interpreted. The song originally was for Ossain but now it is sung for the wind goddess Oya. The moods shift continuously through the high-energy arc of Samba Fogo’s programming. There is a joyful boogie, some examples of Malandro style of samba, including a selection featuring music by Agenor de Oliveira (Cartola, 1908-1980), who was one of the most famous contemporary composers of samba. There are inflections of swing, reggae and even a bit of New Orleans style. Lyrics for many songs are performed either in Portuguese or Yoruba, a West African language that is most prominently spoken in Nigeria and Benin. The program will include the lyrics in English as well as the original language. Hansen adds audience members should not hesitate to clap and stomp their feet throughout the performance, or to dance in the aisles. Samba Fogo also is working with a new costume designer, Cory Thomas Designs, which is based in Phoenix. “They are making some beautiful new costumes for us to perform the fire dance,” Hansen says. “I think the look of our show is going to be quite stunning this year, with many new costumes and some exquisitely talented dancers.” There are seven new performers on stage for this year’s show. The group attracts internationally known artists in the Afro-Brazilian-Cuban traditions as teachers. They have worked in the past with Nininho, a master drummer, composer, innovator, and teacher from Olinda, Brazil. Other instructors who have worked with the group include percussionist Eduardo “Dudu” Fuentes Dudu from Rio de Janeiro and Mark Lamson, known for how he fuses traditional Brazilian and Cuban music with contemporary American and Latin American styles. One of Samba Fogo’s new numbers is the song Caxanga Rosa, originally by Caixa Preta, with an elaborate drum arrangement written by Fuentes, specifically for the group. Samba Fogo also has worked with artists and teachers from the International Samba Congress and the California Brazil Camp. Some of the teachers also work with new students in Samba Fogo’s regular schedule of classes and workshops, often the training and proving ground for performers. The group is well known for openly accepting and encouraging novice and amateur enthusiasts to train and develop their performance skills. “We really see ourselves as this ever-expanding family and it is this attitude that has snowballed into a community model that fulfills so many different interests of the people who connect with us,” Hansen explains. 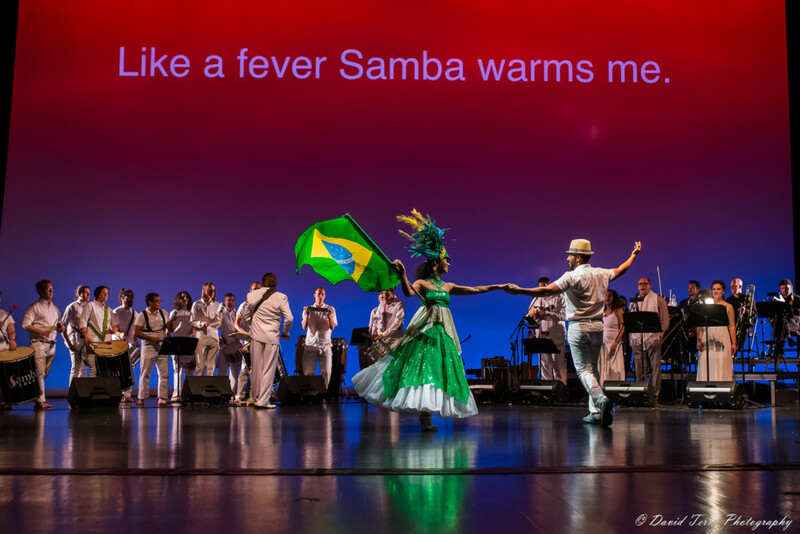 Samba Fogo’s role as a cultural ambassador also has expanded with its performing portfolio. 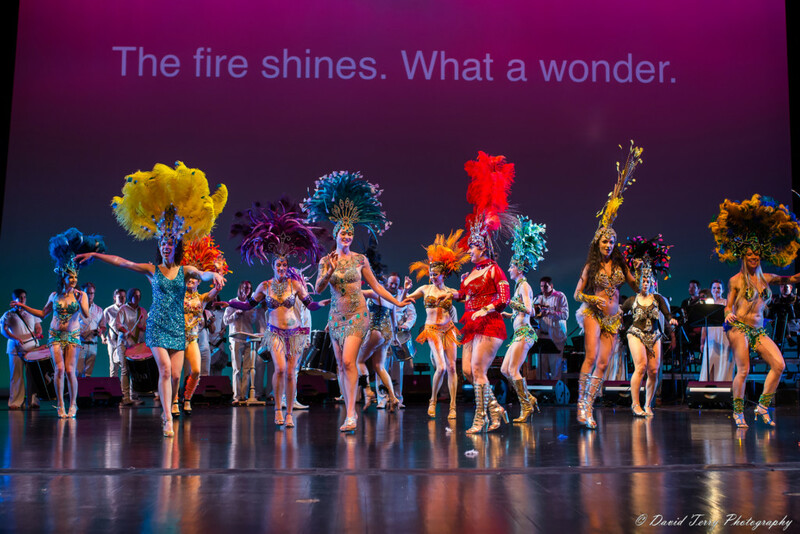 During the winter, the group held its ninth annual juried competition for Rainha do Samba (Samba Queen), with Fiyah Miya, a dancer from the Los-Angeles based group Samba Soul, selected as the winner. Tickets and more information are available at the Samba Fogo website.